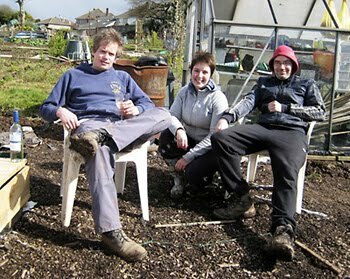 Over the past 4 years we have learnt so much about growing produce and how best to organise a huge 6 perch plot. Here's a run down on what we should and shouldn't do for 2010. Don't plant too many beans. There is always too many. Trim the grass regularly - it takes over plotting land within days. Squashes need a LOT of room. More than you think. Keep the greenhouse/shed organised. We always loose the scissors. Don't try and dig the land after a long dry/warm spell. It's like digging rock! It needs some water retention to keep it crumbly. Comfrey is a pain in the arse and grows within 2/3 weeks to a monster size. Plant it where it won't bother other produce. Handy for fertiliser but it STINKS! Net any fruit in a cage. Birds will stamp on your plants and rip them to shreds if they can reach any of your fruit. Also net seedlings. You will not win the war against bind weed/mares tail, couch grass without using chemicals. You can only control it organically to a degree. Blight will come back the following year once you've had it. Your neighbours will probably have it too. Buy disease-resistant seeds early in the year before they run out in the shops and online. Get a mattock - it's the most awesome tool I have come across. Grow salads and herbs at home in boxes or tubs. Far easier to look after. Dig the land for planting in late summer for the following year. You can guarantee it will be too wet/cold to prepare a lot of beds before April. Cover all unused beds with weed control cloth/plastic over winter. Feed chillies/peppers/tomatoes. They need it.